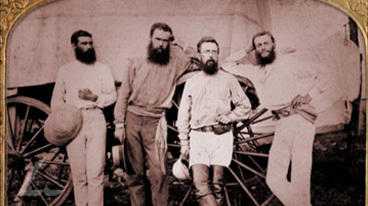 Video clip synopsis – In 1870 Charles Todd, using explorer John McDouall Stuart's maps, organised and lead three teams to lay the overland telegraph wire. Broadband MP4 telegraph_bb.mp4 (21.8MB), suitable for iPods and computer downloads. Todd completes Telegraph is an excerpt from the film A Wire Through the Heart (55 mins), the third episode of the three-part series entitled Constructing Australia, produced in 2007. In 1870 Charles Todd, using explorer John McDouall Stuart’s maps, organised and lead three teams to lay the overland telegraph wire. In eighteen months Adelaide would be linked to London via the undersea cable to Java and then on through India and so Australia was connected to the world. The international telegraph link from Java would come ashore at Port Essington, in what is now the Northern Territory. Stuart had provided a route for an overland telegraph line across the forbidding interior of the continent. All that remained was to build a telegraph wire from coast to coast, passing through the arid heart of Australia. But the logistical problems of construction were immense. The journey alone had nearly killed explorer Burke and his party eight years earlier. Provisioning and equipping the construction teams was an immense task: insulators, batteries, tools – from axes to shovels to wire cutters – food and medical stores, thousands of iron poles for areas where there was no local timber, and 1,800 miles (2,900 kilometres) of galvanised wire, every yard imported from England. Each work party included blacksmiths, carpenters, cooks, storekeepers, linesmen, surveyors and telegraphers, transported by dozens of wagons and hundreds of horses and bullocks and, in the central section, two caravans of camels. The southern section ran 500 miles (800 kilometres) north from Port Augusta. The central section – the longest and most difficult – ran through 600 miles (960 kilometres). The northern section – to be built south from Darwin – covered 700 miles (1200 kilometres). There was no mains electricity to power the telegraph. Instead, every 120-180 miles (200-290 kilometres) along the line there was a repeater station. This was a building where an operator would take down signals and then re-transmit them to the next station. Each station had its own power supply; a set of glass batteries called Meidinger cells. Each cell produced only about as much electricity as a modern AA battery, so large numbers of them had to be hooked up together to produce the necessary operating power, about 120 volts. The batteries required continuous maintenance. And the line itself was simply No. 8 standard wire gauge galvanised iron wire, like modern fencing wire. The telegraph wire would spread like gossamer across the desert, and culminate in Todd’s moment of triumph – sending the first 'wire’ through the heart of Australia. At one point the workers on the northern section of the telegraph downed tools because of poor conditions. In pairs, prepare a dramatic scene of dialogue about these problems and how to resolve them, taking place on location between at least one of the workers and Todd. In groups either rehearse and carry out a play reading to the class, or record and edit the scene as a sound file for playback on a computer. For a recording you may wish to add sound effects, music and a voice-over narration. When Todd returned to Adelaide after the telegraph line was built he was given a hero’s welcome. Research this event, then write a set of private diary entries as though you were Todd, putting down in words your own feelings, thoughts and impressions about what you have experienced, and what you may owe to others, especially to the pioneering work carried out by the late Mr John McDouall Stuart, and the debt of gratitude you owe, perhaps, to your wife. For a short time from the late 1850s to the 1870s newspaper reporters from Melbourne in Victoria were based in Perth, Western Australia, and were constantly travelling to Adelaide by steamer. Discuss in class the objective of this. Could this be the basis for a new TV action-romance-historical drama series? Working in small teams, put together a production proposal to a major TV network for the first series of episodes based on this exciting period of Australian communications history. Your final presentation may be in any suitable format: oral; desktop-published, printed promotional material; or as one or more web pages.